Motul Chain Clean uses no chlorine and features an extremely powerful degreasing agent which removes crusted residues that increase wear: dust, sand, earth and oil. If the chain is very dirty, clean with a non-abrasive brush and repeat as often as necessary. Leave to dry for 5 minutes, then lubricate with Motul Chain Lube or Chain Paste. Always spray the chain with Motul Chain Clean before lubricating. Compatible with all types of chains: standard or O'ring, X'ring and Z'ring. A smooth yellow lubricant, Motul Chain Lube Off Road is highly recommended for off-road use. This specially formulated chain lubricant does not contain sticky additives and is suitable for trails and motocrosses. 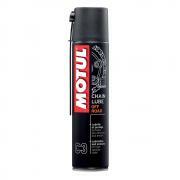 Motul Chain Lube Off Road protects chains from grease and dust build-up. Suitable for all chains with or without O-ring seals.